Gillespie have benefited greatly from the funding and their sporting success has continued this year. The sports premium has been used to continue to upskill our teachers and build their confidence in delivering different sports. This has been done by bringing in expert coaches to teach alongside the class teacher providing them with ideas, confidence and skills. Our PE leader has also been active in the teaching of PE across the school. Due to the PE Leader (Angela Parker) going on maternity leave in December 2017, the funding allowed us to prioritise the importance of PE and we were able to get Rick Byron (the new PE Leader) in for 2 days for a thorough handover of all the sport at Gillespie and the expectations for the next year. To develop the skills of all children in Gillespie, we have employed coach Dan from Islington District Football Development to do lunchtime sessions with all year groups and to coach both the girls and boys football teams. We knew that the girls were enthusiastic about football and coach Dan runs separate sessions for the girls and boys in each year group and has seen increased participation from the girls in each year group. Dan’s coaching has had a real impact on both the girls and boys football teams and this has been evident in their progress in the Arsenal school’s league that they play in afterschool. In 2017 Gillespie won the British Land Cricket Competition in Islington so went on the represent Islington at the Regional Finals where we made it through to the Grand Finals. 140 schools took part in the tournament and only 8 made it through to the finals day at Lord so it was an amazing achievement for a one form entry school. Gillespie have played in the British Land inclusion league for the past 3 years and have built on their performance each year. Last year we won the tournament. Gymnastics has now become a regular feature at Gillespie with all the teachers receiving a whole term of CPD alongside the fantastic coach Rochelle. Rochelle also runs a lunchtime session for those children in KS2 that she has noticed have gymnastics potential in the weekly gymnastic lesson. These children have gone on to participate in the borough competitions. Rochelle is also teaching EYFS in the summer term and running an inclusion gymnastic session for KS1 and KS2 in the summer. 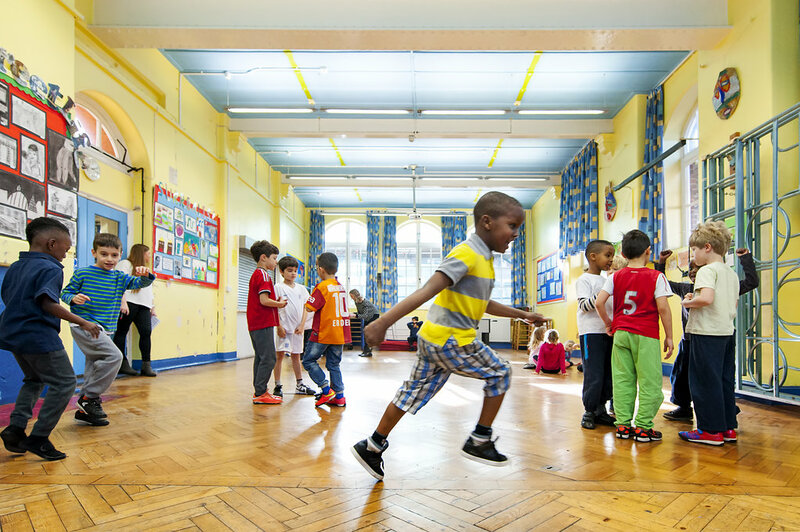 As part of the ongoing incentive to get children to have a healthy lifestyle, the daily mile has been introduced in KS2 to ensure that each child in KS2 does at least 15 minutes extra of physical activity everyday. This was introduced in the second half of the Autumn term 2017 and we will look at the impact it has had at the end of the summer term.